Run your fingers across the sequin, you can get a different color unicorn,Just like magic,on the back we use double pure cotton cover zip closure ,make sue zip is durable and feel comfortable . Material:The front of shiny sparkly unicorn reversible sequin, and the back of white PURE COTTON replace other seller Fabric material. Size: reversible sequins pillow case size is 16" X 16"(40cm X 40cm), Recommend applicable to 17.7"x17.7"(45cmX 45cm )pillow insert,Insert not included. Design: Run your fingers across the sequin, you can get a different color unicorn,Just like magic,on the back we use double pure cotton cover zip closure ,make sue zip is durable and feel comfortable. 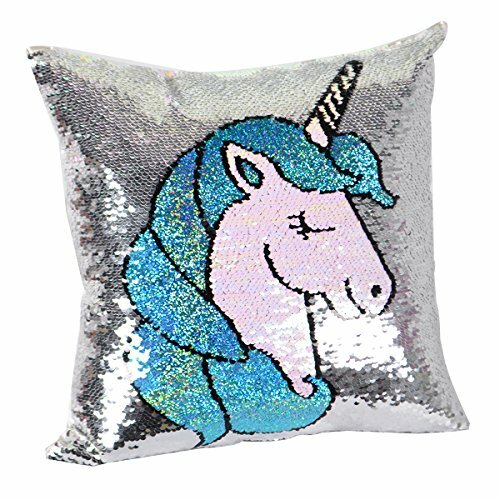 These reversible sequins pillow case perfect for enjoying your free time,watching TV or taking a nap in sofa,decorations for your room, cars and chairs,also good choice as unicorn gift,Warm tips: Hand wash please.